Was Franz Schreker’s Der ferne Klang the first truly modern opera? Given the composer’s sad neglect over much of the 20th century, it’s easy to forget how influential the work and its composer were after the opera’s triumphant premiere in Frankfurt in 1912. 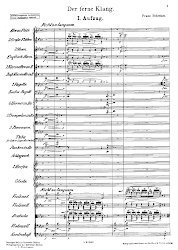 Would Berg, who made the vocal score of Der ferne Klang for Schreker’s publisher, have gone on to write either Wozzeck or Lulu without its example? Both the sense that it is an opera of ideas as much as of incident and that its form and dramaturgy take the medium in new directions make it every bit as revolutionary within operatic tradition as Tristan und Isolde and Pelléas et Mélisande. Fortunately, the musical world is beginning to wake up to its worth, and this is the third production I’ve been fortunate to see in four years, following stagings in Nuremberg (2011) and Bonn (2012), and meanwhile it has also appeared at the Berlin Staatsoper, in Zurich, Strasbourg and at Bard in New York in recent years, and will receive a new production in Graz in the autumn. 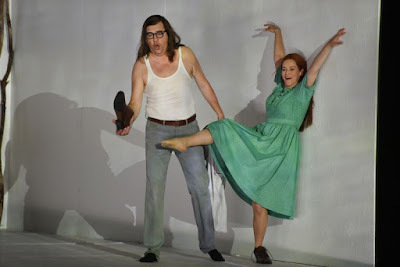 Tatjana Gürbaca’s production for Mannheim’s National Theatre, which also returns in the autumn, emphasises the opera’s modernity by stressing its post-Freudian obsessions of dreams, longing and complexity of relationships, or as the conductor Dan Ettinger suggests in a programme interview, exploiting both musically and dramatically the photographer’s idea of gradations between clarity and blurring, between reality and imagination (he reminds us that Schreker was the son of a court photographer). The fraught love between Grete and the composer Fritz that underlies the plot’s search for compositional inspiration – the ‘distant sound’ for which Fritz yearns – is given a back story with video showing the two as teenagers, and the difference between dreams, memories and the present become clouded in the protagonists’ minds – and, indeed, ours, as we struggle to work out if what we are seeing is the product of Grete’s or Fritz’s subconscious. It may not have been an obvious introduction for those seeing the work for the first time, but Schreker doesn’t exactly make things easy himself, with his shifting between realities and dreams (the warts-and-all verismo of the opening scenes followed by the mystical scene in the wood), a seemingly chaotic second act that encompasses proto-cinematic cross-fades between scenes and musics, and a work as a whole that features an almost ungraspable array of minor characters. But Gürbaca’s direction of these cameos was strongly drawn, from the mysterious Old Woman to the sinister lawyer Dr Vigelius, and Marc Weeger’s cavernous set gave plenty of space and atmosphere to the interpretation’s blurring of physicality and imagination. Mannheim’s National Theatre double-casts many of its productions to cover extended runs and, in this case, the autumn revival, and this was what it termed the B-Premiere, though there was no sense that this was the ‘B’ cast. In the main role of Grete was a singer who had appeared in the role when I saw it in Nuremberg in 2011, Astrid Weber. Her identification with the character was complete, even if one sensed a greater than usual degree of cue-watching of the conductor as she worked herself into this production. It was nevertheless a commanding assumption of a role that journeys so far in so short a time and her singing was firm and focused throughout. The Fritz of Michael Baba, Mannheim’s new house Heldentenor, was similarly committed and was conveyed with plenty of passion if not always suavity, though it’s not an easy role to make one’s own when he is absent from the stage for whole swathes of the work. Raymond Ayers’s Count was a treat, his ballad a highpoint of Act II as it should be, and one must make special mention of BBC Cardiff Singer of the World competitor Sebastian Pilgrim, whose resonant bass made its mark as the Innkeeper and Rudolf. The real star of this performance, though, was the Mannheim National Theatre Orchestra under general music director Dan Ettinger. I’ve rarely heard Schreker’s score come to life with such sensitivity for both colour and dramatic energy, and Ettinger’s understanding of the composer’s unique style – evident in his programme conversations as much as in practice – made the whole, as it should be, an emotionally draining experience and brought Schreker’s own ‘distant sound’ that little bit nearer to repertoire status in our time.